Experience a 6 Hour Fishing Trip Aboard the famous Vessel " Cape May Lady" in Cape May NJ for Fall Stripers or Spring Drum 5pm- 11pm Weekends Only as season starts. Come to Cape May NJ and take a trip with a aboard the famous fishing Charter Boat" Cape May Lady". Cape May Fishing Charter. Make your reservations on-line today! Cape May Lady is the LARGEST half-day fishing charter in Cape May and is setting sail three times daily. Whether your local, on vacation or looking to plan a private charter, we have space aboard our vessel to accommodate everyone in your party and groups of up to 80 passengers. 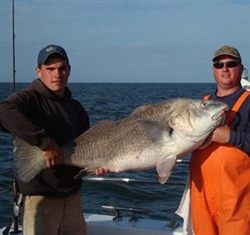 The Cape May Lady Offers 6 Hour Spring Drum Evening Fishing Trips. The Cape May Lady Offer Special Charters and Fishing Trip during the Season, Plan a Fall Striper Trip with friends and family or go on a night fishing trip for Drum in the Delaware Bay. - Book on line with Cape May Resort Simpletix and Save 10% on all fares. Spring Overnight Drum Fishing Trip with 6 Hour Fishing - Book a 6 Hour Drum Fishing Trip Nightly in the Spring. The Cape May Lady runs Spring Drum Fishing Trips nightly into early Summer. The trips start on May 1st and run until June based on weather and conditions. Trips aboard the Cape May Lady run from 5pm to 11pm for Drum. We include all Rods, Bait and Tackle for your Spring Drum Trip. Price Per Passenger - $60 Per Person - Save 10% on this Fare and Book On-Line with Cape May Resort SimpleTix. For Reservations Additional information please click here or call: The Cape May Lady at 609 780-7900 South Jersey Marina Cape May NJ 08204, don't forget to book on-line and receive a 10% discount with all prepaid charters, use promo code CAPEMAYRESORT.